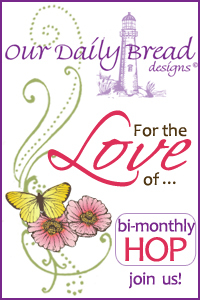 Welcome to the Our Daily Bread Designs Alumni Team bi-monthly hop, this weeks hop theme is For the Love of New Beginnings! I'm the start of the hop this week, a complete list of those participating in the hop can be found the ODBD Blog. You'll want to be sure to visit and comment on all the participating designers blogs, because one of them is a hop hot spot and a name will be drawn from that blogs comments to win a $15 ODBD gift certificate. You have until Wednesday, January 16th at 6PM EST to leave comments. Inspired by this weeks Mojo Monday Sketch and this weeks theme, I used Our Daily Bread Designs Faith , Little Things and the Honeycomb Background stamps on my card. I also used Our Daily Bread Designs Exclusive Butterfly Branch Die to cut out the Butterfly Branch. All pattern papers are from the Bo Bunny Country Garden Collection. I used Ink and Roll Technique to randomly stamp the Honeycomb Background in Blue in onto the pieces of pattern paper. 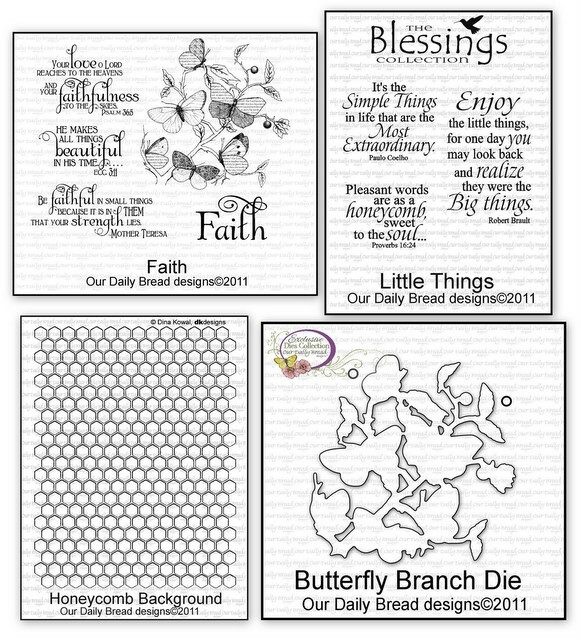 The Butterfly Branch from the Faith set is stamped in Black on a piece of scrap pattern paper, then die cut with the Butterfly Branch Die using the Big Shot. I stamped the image again on scraps, cut out the butterflies and adhered them over the stamped image with dimensionals. To add color to the branch and leaves, I used STAEDTLER Karat Aquarell Watercolor Pencils. Thanks so much for stopping by, your next stop is Betty's Blog. I love butterflies and what you've done with them. Great colors! Love the subtle colors in this card! wow, what a great card to begin the year with. I love butterflies and soon hope to see some. tfs. Happy New Year! Beautiful card! I love butteflies, and you've done such a beautiful job displaying them on this lovely card. Love this stamp----beautiful. Of course I am partial to butterflies among other things. Beautiful card too. you did an awesome job with this stamp. This card is beautifully done. Thank you for the inspiration. Beautiful card! Love the watercoloring effect, so calming and peaceful. Thanks for sharing! So fantastic, Lisa. i love ODB designs. They are truly beyond gorgeous. Thanks for sharing your card. Your card is just lovely. Such soft and serene colors, with lots of beautiful detail. Just lovely! Happy New Year! This is a great card. I love the combination of ODBD stamps that you used. This is a beautiful card! I like the paper pieced butterflies and the soothing tones in the paper. TFS!!!! This is a beautiful card. I love all the detail in it. Very pretty card! Love the butterfly garden! Wishing you a wonderful 2013! so pretty love that butterfly and branch die. This is beautiful! At first I thought you fussy cut it and then I realized there was that fabulous die, love! This is just beautiful! Love it and the die really is a great tool! Gorgeous!! and the best part about it is I have all the stamps to case this, lol!! yeayyyy! Lisa! You did a LOVELY JOB on this card! LOOOOOOVE the Honeycomb Background stamp & the Butterfly stamp is SUPER! LOOOOOVE the print on the wings! AND I know you used the water color pencils...your card has a WATER COLOR FEEL to it! 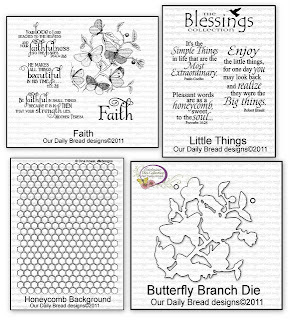 I think more from the designer papers & the honey comb stamp! :) IT'S BEAUTIFUL! VERY CALMING BLUE! Beautiful card and my favorite Butterflies. love the colors. I love your hops all the super projects and Ideas. thanks for sharing. LOVE, LOVE, LOVE this card!!!!! Your cool style blows me away every time!!!! HUGS!! Such a beautiful card. How did I miss seeing that butterfly stamp and die cut before? I love it ! such detail I am always amazed at the numbers of challenges and talent demonstrated in this site's hops! Adore the butterfly branch. It's a beautiful card. Oh my gorgeousness! This is so beautiful! Love the butterflies and sentiment is beautiful! An absolutely stunning card... I love the colours, and the stamp+die butterflies have just gone on my wishlist! So soft and beautiful, I love the blues. Butterflies are one of my favorite things to use on cards....kind of my signature. The soft blue shading is awesome. Thanks loads for this card. Beautiful card -- my favorite color is blue. I love the stamp sets also. 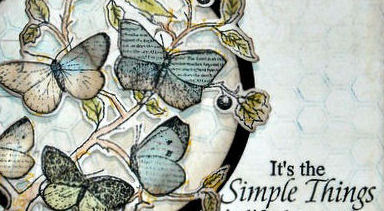 Love the butterfly stamp/die and the elegant card you created with them. Very effective. Wow Lisa!! This is gorgeous!! I LOVE the sketch and colors and the fabulous bg you've created! What a work of art! This is beautiful! New to the designs I love the butterfly stamp and die set - and the "blues" are a soft touch! Absolutely GORGEOUS!!!!! Love the blues and your wonderful background - so creative!! Hugs! Beautiful card! I have this stamp and love it! Beautifully muted and artistic card! Love how you used so many stamps so beautifully on this card. ooohhhh . . .how pretty! Love your soft colors and that butterfly circle. Lovely Lisa! Like the b'flies, layout....faded honeycomb and stitching.....great card! What an amazing card! Those colors are so beautiful together! Gorgeous, Lisa! I love this stamp set and what you've done with it here! Wonderful texture with just a hint of the honeycomb pattern, and the butterflies are beautiful! Very pretty--love the butterflies and honeycomb. Absolutely beautiful card,,,thanks for sharing! Super cool, Lisa! Love the colors and layout!!! What a pretty card!! I love the butterflies, and especially in blue...love your BG too...Awesome!! Love those butterflies, gorgeous colors. What a beautiful card. Love the design. Thanks for sharing. What a stunning card.. Wonderful colors. This is amazingly beautiful, LOVE it!!! This lovely card caught my eye on somebody's elses blog - listed under the gadget with blogs - and now I am doing the hop, and became follower via e-mail! I'm going to have a look through your blog just now! I love your water color pencil technique, i must find a tutorial. i have them but really don't know how you're supposed to use them. beautiful card! Love your card - it is simply beautiful. Thanks for sharing. Gorgeous, Lisa! Love the colors and the coloring! Beautifully done! What a delicate and beautiful card. I love the butterflies and the soft colors! beautiful card, love the watercolors. wonderful choice is color and stitching detail. thanks for sharing. What a gorgeous card! Wonderfully showcases these stamps! Your card is so well done! I am new to your blog, and I thought it was a graphic! Just beautiful! In my mind, you can never go wrong with butterflies, and you really did it right! Lovely card, very delicate! Your art work goes beautifully with your sentiment. Lovely creation. The butteflies look so real. Dreamy card. How pretty! The butterflies just pop off the page! I love the soft color scheme and the butterfies are gorgeous. I also like how you used the Mojo Monday sketch as inspiration. Your card is extraordinary! Beautiful sentiment. Love the delicate butterflies! I love this card! I am new to ODBD and can't believe how much I've missed! What a beautiful card! I am new to ODBD and can't believe what I've been missing? Beautiful card Lisa! Love the color combo... so peaceful and soothing! A beautiful card with a wonderful quote. This is beautiful Lisa. I love your soft colors and that wonderful sentiment. I also really like the way you added dimension to your butterfly branch. Those stamps with matching dies are some of my favorites. Since I love cutting and layering, they make it so easy. Fussy cutting takes too long! So pretty! Love the distressed look of the honey comb background, TFS!